Roxette submitted incorrect information to the Tax Authority after the world tour in 1994 and 1995, and now they are finally charged with 4.5 million SEK to pay. The Supreme Administrative Court rejects Per Gessle and Marie Bolyos (former Fredriksson) appeal. The investigation began ten years ago, when it was suspected that Per Gessle and Marie Bolyos bypassed tax during the part of the tour, which was held in Germany. Fees were paid to the artists' joint production company instead of salary to the artists, who were therefore not submitted to income tax obligation. The money, however, is to be regarded as income, because the artists had them. Therefore, the fact is that Per Gessle with just over SEK 2.3 million and Marie Bolyos with over 2.2 million have to pay. Tax requirements apply also travel benefits for Per Gessle wife and Marie Bolyos husband, who accompanied them on the tour. STOCKHOLM - Per Gessle and Mats MP Persson will travel to London October 7 to receive yet another "Million-Air" award for "Listen to Your Heart." "Listen to Your Heart" has been played over 4.000.000 times on US radio, same as "It Must Have Been Love" in 2005. According to BMI.com, based on an average length of three minutes, one million airplays is the equivalent of 50,000 hours or 5.7 years of continuous airplay. Top Million-Air songs are for instance The Police's "Every Breath You Take" and The Beatles' "Yesterday" with both over 8.000.000 plays. Roxette has eight BMI awarded songs. Per Gessle is obviously very pleased with this and comments "Yay!" For reasons yet unknown Roxette's US #2 single from 1989, "Dangerous", has entered the Australian download chart at #30. The Oz people are famous for their exquisite taste. Marie and myself are very happy indeed comments Per to The Daily Roxette. Do you remember magazine like "Bravo", "Salut" or "Popcorn"? Here are some examples of pictures, articles or posters that made the fans very happy. 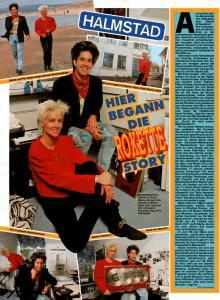 We launched a gallery section at http://www.roxette.ro/gallery/scans. Those who have some more materials, and want to share them, please contact us! Thanks Ovidiu! Marie - a new smile, a new perspective, and why not, a new Roxette comeback! According the comments of the Roxette fan, Roxette-atic, in the morning interview made to Marie Fredriksson in the tv channel Tv4, she is certain that Roxette will be back. The reporter asked her if she really had the power to do a big comeback but she replied that maybe she and Per could do something a little bit smaller than before. Per and her are talking all the time about a comeback. The video online of the interview.